My friend, Susanna, owns the fabulous painting you see in the photos. I recently said “we should knit that sweater!” She agreed. 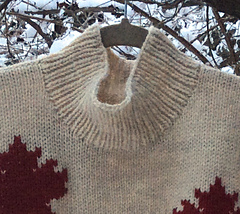 Then, not long after, the yarn shop 88 Stitches, in Langley BC, sent out a blast on Ravelry to say that—for Canada’s sesquicentennial—everyone should knit a garment by a Canadian designer. I immediately thought of the painting. 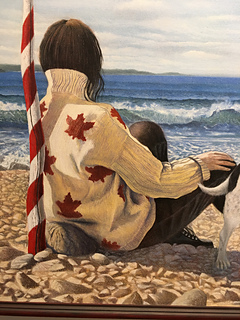 But the details in the painting are so clear that either the painter was a knitter or the sweater actually existed. I needed to get the story and permission. So I wrote the painter, Steven Rhude (www.stevenrhudefineart.com), asking about the sweater. His answer was immediate and wonderful! I have searched for a pattern, but there does not appear to be one. Apparently, as Steven believes, his mother just “went for it.” (It is amazing that she did this before we had our official flag!) He then invited me to do the same! 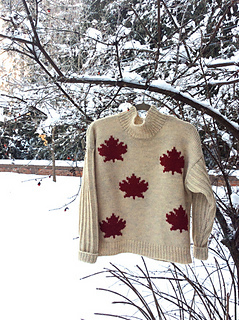 So I did, copying the original faithfully except that I made my maple leaves look more like the flag we now have. 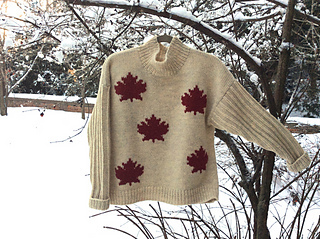 So here we are, with a great story and a wonderful sweater. 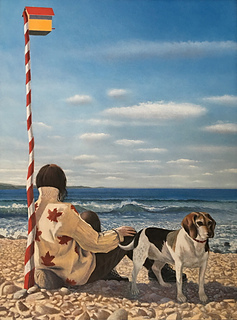 I chose not to hire a model for this one, since the original (in the painting) is so beautifully evocative. But as you can likely see, the garment is a basic drop shoulder. This will be my offering to our sesquicentennial … something for everyone in honour of a nation-wide celebration. I have written the pattern in 10 sizes—12 months to adult 2X—with generous ease. The Ravelry page does not allow me to enter this information here, but the 4 child’s sizes are to be knit in a finer and machine-washable yarn.